India is the world's third biggest and the fastest rising oligarchy with 17.2% of its GDP amassed by its 55 billionaires. India's system of governance has some of the worst of features of democracy and oligarchy in which the democratically elected politicians are bought off by the richest Indians, and both groups further enrich themselves at the expense of the vast majority of ordinary Indians. The biggest Indian oligarchs today are mainly industrialists like Ambanis, Adanis, Birlas, Mittals, Premjis and Tatas. Like India, Pakistan is an oligarchy as well. But it is dominated by the feudal rather than the industrial elite. These oligarchs dominate Pakistan's legislature. Vast majority of them come from rural landowning and tribal backgrounds. Well-known names include the Bhuttos and Khuhros of Larkana, the Chaudhrys of Gujarat, Tiwanas of Sargodha, Daulatanas of Vehari, the Jatois and Qazi Fazlullah family of Sindh, the Gilanis, Qureshis and Gardezis of Multan, the Nawabs of Qasur, the Mamdots of Ferozpur/Lahore, Ghaffar Khan-Wali Khan family of Charsadda and various Baloch tribal chieftains like Bugtis, Jamalis, Legharis, and Mengals. The power of these political families is based on their heredity, ownership of vast tracts of land and a monopoly over violence – the ability to control, resist and inflict violence. Pakistan, too, has an industrial elite. Its biggest names include Manshas (Nishat Group), Syed Maratib Ali and Babar Ali (Packages) Saigols, Hashwanis, Adamjees, Dawoods, Dadabhoys, Habibs, Monnoos, Lakhanis and others. But their collective power pales in comparison with the power of the big feudal families. The only possible exception to this rule are the Sharif brothers who own the Ittefaq Group of Industries and also lead Pakistan Muslim League (Nawaz Group), one of the two largest political parties. But the Sharifs too rely on political support from several feudal families who are quick to change loyalties. The origins of the differences between Indian and Pakistan oligarchies can be found in some of the earliest decisions by the founding fathers of the two nations. India's first prime minster dismantled the feudal system almost immediately after independence. But Nehru not only left the industrialists like Birla and Tata alone, his policies protected them from foreign competition by imposing heavy tariff barriers on imports. In Pakistan, there was no serious land reform, nor was any real protection given to domestic industries from foreign competition. Oligarchy is the antithesis of democracy. However, it's important to understand the differences between feudal and industrial oligarchies, and their effects on nations as observed in South Asia. Industrial oligarchs of India have accelerated economic growth, created a large number of middle class jobs, increased India's exports significantly and paid higher taxes to the tune of 17% of GDP. This has created a trickle-down effect in terms of increased public spending on education, health care and various social programs to fight poverty. Unfortunately, the tax collection in Pakistan's feudal oligarchy remains dismally low at less than 10% of GDP, and the lack of revenue makes its extremely difficult for Pakistani state to spend more on basic human development and poverty reduction programs. As to the future, the hope for Pakistan is that the feudal hold on power will eventually weaken as the nation sustains its rapid pace of urbanization. Pakistan has and continues to urbanize at a faster pace than India. From 1975-1995, Pakistan grew 10% from 25% to 35% urbanized, while India grew 6% from 20% to 26%. From 1995-2025, the UN forecast says Pakistan urbanizing from 35% to 60%, while India's forecast is 26% to 45%. For this year, a little over 40% of Pakistan's population lives in the cities. The political power shift from rural to urban areas may eventually produce a more industry-friendly government in the future. Such a government can be expected to help increase the tax base significantly, permitting greater spending on education and health care, and reduced dependence on foreign aid. Is There a Threat of Oligarchy in India? Another interesting side effect of an industrial oligarchy is that the amount of funds they give the political classes is many orders of magnitude more than any 'marketing expenses' type payment of MNC corporations can make. Therefore Indian political class as corrupt as it is will always take 'patriotic' protect thy industry type of decisions even though they don't have even 1% of the integrity of our founding fathers. Riaz - This topic is worth a book at least. Please continue expounding on this. Perhaps others may have written on this topic- but your style and inexorable process of presentation appeals to me. India also has large landlords (only certain type were removed by Nehru). The difference with Pakistan is that it doesn't have the industrial oligrahs. Hey, it might have had them if Bhutto hadn't nationalized companies! considerable variation across types of land reform, as well as variation across states. other than West Bengal, where tenancy reform had been poorly implemented. Found this on net today...click on URL to see more related info! India's invasion by the British brought about, in the course of time, a complete transformation in the country's land tenure system. The East India Company experienced difficulty in its trading because the sale of British goods in India was insignificant. On the other hand, the exportation of gold and silver from England to pay for Indian goods was soon prohibited. The company found a solution by securing money from India to pay for Indian goods. It collected taxes for the Indian rulers which, in the beginning, brought revenues of only 10 % of the levied taxes, but, since the control over the amount of levied taxes became lax at the end of the Mogul period, its revenues increased. In addition, they were assigned areas as "jagir:°' The decisive breakthrough came when, in 1765, the office of 'dewan' for Bengal, Orissa, and Bihar, namely the financial sovereignty for these areas, was assigned to the Company with the concession for levying taxes in exchange for a global sum of Rs. 2.6 million per annum. amount was fixed at the beginning and remained the same permanently. To give them an incentive, they were free to decide how much to demand from the cultivators. On the other hand, the fixed lump tax sum was an incentive to put more land under cultivation and, thus, have more taxpayers in one region. In order to do so, one could rot bleed the individual farmers too much. Riaz, my reading of Pakistan history does not support a few assertions you've made. Pakistan did not have an industrial structure at the time of partition to support. When the industrial structure did develop - in the 1960s under Ayub - it was given a lot of protection from foreign competition, cheap access to government finance (through PIDC etc.). You forget the 22 families that almost owned Pakistan's commercial assets. But then there was a counter revolution. Bhutto's socialism was largely a response to Ayub's 22 families. He nationalised the industry and hence broke the back of capitalism in Pakistan. Athar: "Pakistan did not have an industrial structure at the time of partition to support." Athar, I agree that Pakistan had no heavy industry in 1947, but it did have many industrialists like Adamjees, Dawoods, Habibs, Manshas, etc who migrated from India and could have been better supported by the govt in 1940s and 1950s under civilian rule. They were Pakistan's Birlas and Tatas. In fact, they were better. Pakistan's first budget projected a revenue of Rs 150 million and govt had to borrow Rs 80 million from the Habibs to pay govt employees' salaries and meeting other contingencies. It took a military dictator Gen Ayub Khan to see the light and do what was necessary, but Bhutto quickly destroyed the nascent industries by taking them over, and rolled back the progress made under Ayub to restore feudal primacy in Pakistan. Actually India's mega corporations particularly Tata is on its own bigger than PAkistan's Industrial output. India's mega corporations are kind of like South Korea's Chaebol and Japan's Zaibatsu. They were Pakistan's Birlas and Tatas. In fact, they were better. Please read and tell me exactly how any of these holds a candle to this behemoth??? Riaz I thought u believed in free trade and low tarriff barriers? Btw do Pakistanis as consumers and a nation have the steely resolve to patiently live with substandard products while the Pakistani industry learns the ropes?? Remember Industrial bases aren't created overnight it takes 20-30 years for an industry to stand on its own two feet. Anon: "They were Pakistan's Birlas and Tatas. My yardstick is not the amount of wealth but how much do these rich industrialists care for their nations. Going by this standard, I think Pakistan's Habibs stand heads and shoulders above their Indian counterparts. In 1947 when Pakistan was struggling to survive financially because India refused to give its share of central bank reserves inherited from the British rulers, the Habibs provided Rs. 80 million cash to the state of Pakistan, more than half of the nation's first total budget of Rs. 150 million. I guess you are aware that Pakistan's agriculture contributes barely 20% of the total GDP, whereas the industry contributes 25% and the rest comes from business and services such as banking, airlines, hotels, transportation, telecom, etc. That is why I am not totally convinced with the findings of your blog post, but you are right to some extent. Agriculture in Pakistan is a big business. Pakistan's average cotton yield is 750 kg per acre, and wheat is 1,000 kg per acre. At cotton spot price of Rs. 9,000 per 40-kg bale, and Rs. 950 per 40-kg bag of wheat, a large landholder with 1,000 acres will get a gross revenue of $2,000,000 in cotton and $300,000 in wheat. There are many landlords who do own 25,000 acres or more, but no all of that is cultivatable. Either way, the largest landlords with 25,000 acres or more of "cultivated" land are known to take home a gross revenue of no more than $30-50 million per year if they are growing cotton, and $3 to 10 million if they are wheat growers. Agricultural equipment such as tractors are thrashers are a "consumable" items. Compare that to the industry and business, and let's keep an eye on politicians as well -- the only dollar-billionaires in Pakistan are either the industrialists and businessmen (Sharifs, Hashwani, Dawood, Yacoub, Mansha, etc. ), or the politicians (Zardari, etc.). Hence there is no basis to suggest in your blog that the agriculturists have a largest money pool in Pakistan. They make less, and none of them is known to have a nine-digit net worth (in dollars). Their power comes from the voting power of their hari slaves. That is why true democracy in Pakistan is not good for country's growth and stability. True democracy, if it ever comes, will be a long time coming. Shams: "I am not totally convinced with the findings of your blog post, but you are right to some extent." As part of India's 2G scandal revelations, the Billionaire businessman Mukesh Ambani has been quoted as bragging that India's ruling Congress Party is "Apni Dukan" (our shop), implying that he owns the ruling party. No ordinary Pakistani, certainly not any Pakistani industrialist, could make such a claim about owning the ruling PPP. Only a Pakistani feudal can. This is the crux of my post. That's fine but how do you square this with financing the entire Indian independence movement right under the noses of the British running the very real risk of being imprisoned and loosing everything.Remember in 1910s it was far from certain that the mighty British Empire would simply let India go. Also Tatas also created the blue print for India's industrial base by building steel plants right under the noses of the British despite massive opposition from them who were keen to have India only as a resource colony. Anon: "The PRIMARY thing is the Industrial Base , Industrial and Manufacturing Capability and the Technological strength that the private sector of any country brings to the country "
Yes, but to what end? Surely, "Industrial Base , Industrial and Manufacturing Capability and the Technological strength" are not the ends in themselves. Or, are they? Compared to 3rd world countries it is but we have a long long long way to go before we can compare our industrial base and tech capability to US,EU.Japan or even China. We should not rest on our laurels we are in very early stages of our development comparable to China in 1990s but unfortunately unlike China back then we face a very turbulent international financial enviornment just when our export sector is firing up. This is NO time for bravado! Well they sort of are a good industrial base makes you financially solvent and ushers in a technocratic middle class.How this evolves ofcourse is a different matter more a comparatively earier question of dividing the cake the industrial base is about baking one in the first place. ALL industrialized countries have had high inequalities and concentration of wealth in the initial stages of development.No exceptions. well the same formula is being used everywhere in the world .. the rich buy Politicians ... e.g republican of US ? Aamir: "well the same formula is being used everywhere in the world .. the rich buy Politicians ... e.g republican of US ?" This is misleading u are comparing TOTAL WEALTH with ANNUAL GDP. I think a better measure will be TOTAL WEALTH/Capital stock of the Country. Also remember that most Indian firms are listed on the sttock market and the current high valuations are a transient phenomena.Also Indian business leaders rarely control >20% of their companies.The balance is owned by banks and financial institutions(which are about 80% government),retail and FII investors. Taking all this into account while concentration of power in India is there it is nowhere near as powerful as JP Morgan or John D Rockefeller's clout in 19th century America. Anon: "Also Indian business leaders rarely control >20% of their companies." The data I have shared only counts the equity owned by the Indian billionaires, not their entire companies' market caps. Any way you look at it, the concentration of wealth by Indian oligarchs is huge, surpassed only by their Russian and Malaysian counterparts who are known to be extremely corrupt cronies of their equally corrupt politician friends. It's crony capitalism at its worst. Ambani is worth approx $25 billion.However he DOES NOT on a pro rata basis produce $25bn worth of value every year. The way to do this would Ideally be the CAPITAL STOCK of India Inc ie about $5 trillion($3 trill BSE +2trill unlisted ) and THEN divide it by his weath to see how much influence he has. Other than that these stats are just talking points. Anon: "However he DOES NOT on a pro rata basis produce $25bn worth of value every year." GDP is a standard benchmark used by economists and others to compare countries in terms of national debt, spending, deficits, wealth inequalities etc. 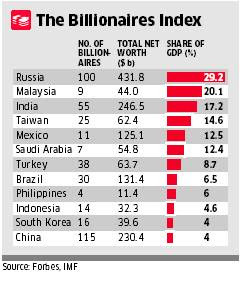 Based on this benchmark, India ranks third as an oligarchy behind Russia and Malaysia. There is a very fundamental problem with you arriving at the conclusion that India is the third biggest oligarchy, and thereby the implicit suggestion that pakistan has fared better. You use the information presented in the "billionaire's index" as a reference point. But pakistan barely has a couple of billionaires. That doesn't mean that wealth is widely distributed in paksitan and that money is NOT concentrated in the hands of a few MILLIONAIRES, if not billionaires. Gentlemen such as Abdul Ghafoor and Ali Lakhani have amassed great wealth, but are still shy of the billionaire tag. The following link gives a rough sketch of the top industrialists in Pak and their net worth. I did a rough calculation. The combined net worth of the names listed, stood at 26.15 billion dollars. And SURPRISE - it stacks up to about 16.25% of the pakistan's GDP. Furthermore, the data listed on the link appears to be a little old. I'm sure the net worth of these behemoths would have climbed. You'r in dreamworld, my pakistani friend. Surrounding yourself with twisted data doesn't change anything for your country. The only difference is that Indian oligarchs are bilionaires. whereas, oligarchs in pakistan are millionaires, trying to get a toehold in the big league. If not crony capitalism - then I guess it fair to extrapolate that some thing is seriously wrong with Pak. Anon: "The Indian people know MUCH more than you that ,which policies are good or bad for them"
Indian electorate consists mainly of poor, hungry and illiterate people who swing elections to Congress or BJP to their own detriment. The Indian people are easy to manipulate by corporate-owned media which sings praises of India's corporate sector and tries to hide facts from them about the depth and breadth of poverty that is worse than sub-Saharan Africa. Last year, the Indian mainstream media imposed a blackout on 2G scandal revelations until a small news outlet broke the story. "The media in India is free, the government doesn’t have the power to control it. But what I saw was that it was pretty restricted, very narrow and provincial and not very informative, leaving out lots of things. What I saw was a small sample. There are very good things in the Indian media, specially the Hindu and a couple of others. But this picture (in India) doesn’t surprise me. In fact, the media situation is not very different in many other countries. The Mexican situation is unusual. La Jornada is the only independent newspaper in the whole hemisphere." Ashmit: "There is a very fundamental problem with you arriving at the conclusion that India is the third biggest oligarchy, and thereby the implicit suggestion that pakistan has fared better." It's clear you have either not read or not understood what I wrote. As to inequality, there is plenty of Gini data over the years to show that Pakistan has lower poverty and it is more egalitarian than India and most other countries of the world. Gee something India and Pakistan have in common! As for egalitarian, I recommend a book written by ANATOL LIEVEN, titled"Pakistan a hard country". This writer is of course biased against India, but he will cure the riddle of "low poverty","industrial powerhouse", "egalitarian" asked by Riaz. Rahul: "Now you will quote the MPI poverty index of 2010 where Pakistan has 51% and India 55%"
I can also now quote a recent 2011 World Bank report. Rahul: "As for egalitarian, I recommend a book written by ANATOL LIEVEN, titled"Pakistan a hard country"." Good recommendation. I have read Lieven's book, and it confirms that Pakistan has lower poverty and lower Gini i.e. less inequality than India. "This system (of kinship groups) has a critical effect on Pakistan's remarkably low inequality rating according to the Gini Coefficient, measuring the ratio of the income of the poorest group in society relative to the richest. In 2002, according to UN statistics, it was 30.6, compared to 36.8 for India, 40.8 for the US, and 43.7 for Nigeria. I think a broader insight is that the Hindu elite modernized under the British to a much greater extent than Muslims. There were hardly any Muslim corporations in British India comparable to TATA,Birla,Mahindra etc. Muslims were(are?) still living in the past with jagirs of land being the chief determinant of status. In 2015 as per current trends India will be 2-3 times richer than Pakistan. Perhaps Riaz, read only that part of the book, not the other parts. The author gives a vivid explanation of the Pakistani society. It accurately describes that the structure of Pakistani society prevents innovation, modernism, women rights, and progressive industries and infrastructure. The lower of gini coffiecient is also well described by the author. The author says that, in order to maintain the kinship, the corrupt landlords, distribute the ill-gotten wealth(through corruption and drugs) to their followers. Therefore the followers get the money, not the needy, but the flatterers. This structure prevents growth of capital and modern industries. So the landlord does not create money but simply distributes what he gets through corruption. Gini coefficient is of course not a main economic and developmental parameter. Otherwise USA would not be at such a high HDI rank, other factors count mainly. While the blogger compares the figures of current poverty rates, he fails to appreciate the potential of India in reducing poverty from 51% to 22% in just a span of 4 years. The book accurately describes that except Northern Punjab, and parts of Urban Sindh, how all other regions are quite backward, and the people also do not want to change the methods. This is stark contrast to India, where the society is fighting to remove corruption, actively supported by all sections of the society. Rahul: "It accurately describes that the structure of Pakistani society prevents innovation, modernism, women rights, and progressive industries and infrastructure." While I agree with Lieven's criticism of Pakistan's feudal oligarchs and politics of patronage (and I have written about both), I disagree with your characterization that it "prevents innovation, modernism, women rights, and progressive industries and infrastructure." Pakistan has a larger middle class than India's and it has a more advanced infrastructure than India. "Pakistan also contains islands of high technology-above all the nuclear industry, which (whatever you may think about its strategic implications, is a very remarkable achievement for a country with Pakistan's economic profile, and shows what Pakistani state can achieve if it really sets its mind to it, and can mobilize enough educated, honest and committed people." Rahul: "Therefore the followers get the money, not the needy, but the flatterers. This structure prevents growth of capital and modern industries. So the landlord does not create money but simply distributes what he gets through corruption." Not entirely true. The needy do get a lot of help as part of patronage system and Lieven points it out by saying that they maintain large staffs regardless of need and offer help to their constituents when asked. As he criticizes Pakistan which is the subject of his book, he does not spare India either when he does comparisons. "Certainly, most people in Pakistan are poor (by whatever standard he has in mind); but all the same, as a result of economic growth, together with the effects of Islamic charity and the circulation of state patronage to kinfolk and followers of successful politicians, Pakistan lacks the huge concentrations of absolute poverty to be found in India's cities and countryside." Your articles always try to prove Pakistan is better than India but I still acknowledge this article is good. I once heard Parvez Musharraf saying," The cause of the fail of democracy in Pakistan is because the founding fathers of Pakistan tried to merge feudalism with democracy and it turned out to be a disaster." These rich billionaire whatever they are, they always try to expand their business by investing more which will bring more jobs to the people, create more educated class and if they invest outside their country it will create brand of their own country like Lakshmi Mittal,Aditya Birla and Tatas. I don't think Zagirdars and waderas will ever do such things.They don't have such wisdom. Whatever Zagirdars/Waderas got that is because of their loyalty to British but Industrialist created everything from scratch. Sunil Mittal started his Airtel company with just 30 employees in 1992 and by 2010 his company has revenue of $9.3 Billion and assets of $15.5 Billion with operations in South Asia, Africa and parts of Europe. So, the story of Infosys's Narayanmurthy who sold his wife's jewelry to start his business. Such type of people give inspirations to young entrepreneurs. India has right now external debt of about $237 Billion(15% of GDP) and Pakistan has about $57(33% of GDP). There is something called Standard and Poor's credit rating. All super economies has AAA rating. China has AA- rating. India has BBB- rating and Pakistan has B-. B- is just above CCC rating (for Bankruptcy) which denotes Pakistan economy is still in chaos. Pakistan faced CCC just recently in 2008 and India in 1991. But I will still acknowledge Pakistan is better than India in many parameters as they fared well between 1947-1989 and India failed to do so in their idiotic socialism. But current trends show that Pakistan will even lose that in coming years. Nouriel Roubini, Project Syndicate: "This year has witnessed a global wave of social and political turmoil and instability, with masses of people pouring into the real and virtual streets.... While these protests have no unified theme, they express in different ways the serious concerns of the world’s working and middle classes about their prospects in the face of the growing concentration of power among economic, financial, and political elites." Your (Thomas Piketty's) data says that the top 1% in India owns about 8-9 % of national income. That's not much compared to the West, yet inequalities here appear starker. Is it that inequality being a relative measure, the absolute nature of poverty gets sidelined? Let me make it clear that there are major problems with the measurement of income inequality in India. Of course, there are data problems in every country. But among all democracies, India is probably the country for which we have met the largest difficulties in getting reliable data. In particular, India's income tax administration has almost given up compiling detailed income tax statistics, although detailed yearly reports called "All-India Income Tax Statistics" are available from 1922 to 2000. This lack of transparency is problematic, because self-reported survey data on consumption and income is not satisfactory for the top part of the distribution, and income tax data is a key additional source of information in every country. The consequence is that we know very little about the actual decomposition of GDP growth by income and social groups in India over the past few decades. You propose a 'utopian' global wealth tax to redistribute wealth. If it is so impracticable, what's the use of proposing it? A global wealth tax together with a global government is certainly a utopia. But there is a lot that can be achieved at the national level and through intergovernmental agreements. In particular, countries like US, China or India are sufficiently large to make their tax system more progressive. For instance, the US — about one quarter of world GDP — could transform their property tax into a progressive tax on net wealth. They are sufficiently large to impose credible sanctions on countries and banks (like Swiss banks) that do not transmit the information they need to enforce their tax law. You criticize economists for their 'childish passion' for mathematics in your book. How should they deal with their subject? I am trying to put the distributional question and the study of long-run trends back at the heart of economic analysis. In that sense, I am pursuing a tradition which was pioneered by the economists of the 19th century, including David Ricardo and Karl Marx. One key difference is that I have a lot more historical data. With the help of many scholars, we have been able to collect a unique set of data covering three centuries and over 20 countries. This is by far the most extensive database available in regard to the historical evolution of income and wealth. This book proposes an interpretative synthesis based upon this data. I also use simple theoretical models in order to account for the facts.